Kamal Hassan and his latest movie Viswaroopam are the hottest news in the country today. Viswaroopam has become a controversial topic even prior to its release. Some Muslim extremists from various parts of the country have raised swords against the movie and its creator, Kamal Hassan. The point of argument is that, Viswaroopam talks against the whole Muslim community and tries to mark them as terrorists. But in fact, Viswaroopam has nothing in it to hurt the religious emotions of any community. It doesn't try to marginalize Muslims as terrorists. If I tell the truth, the movie has nothing to evaluate or praise or criticise. It is just another cinematic extravaganza from Kamal Hassan, who has done all the major roles in the movie, both off and on screen.He has written produced and directed the movie. As we all know, India is the largest democracy in the world. A country which boast off, it’s so called unity in diversity slogan. But in reality what happens in India? If you don’t know, Viswaroopam is the answer. It is just a movie like countless other attempts. A man, who is considered as the genius in Indian cinema is being crucified for a baseless reason. Tamil Nadu government is playing a cheap political game driven by pure economic undercurrents. So they used the most sensitive weapon, religion. Some people always wish to lock themselves inside a blind religious outfit. They always search for a reason to protest and raise their pseudo beliefs. This phenomenon is lexically called stupidity. And Kamal Hassan is the current victim of it. If you want to talk about Viswaroopam or protest against it, let him release the movie. Then watch it. Find where your religious emotions are attacked. The major problem lies on the point that we are not ready to listen. We just want to act, react. People who doesn't have their of personality will always act according to the direction of the wind. But remember, as you have the right to protest, Kamal also has the right to exhibit his work of art. Whether it is good or bad is the second question. Let me go back to the movie. Viswaroopam has an international terrorist story to deliver.Here the hero is a spy. But nothing touches the audience and the film ultimately fails to convey a solid theme. In fact it lacks a solid thread. Only the huge investment is visible in the movie. The production quality, sound etc. can be praised if you want something positive. Technical side of Viswaroopam is awesome. It is the world’s second movie with Auro 3D Sound. Kamal Hassan is always the same. So no need of a comment to his performance. Other actors like Pooja Kumar, Andrea Jeremiah, Rahul Bose etc. also have performed well. Viswaroopam is another platform for Kamal to show off his another extra human avatar. But people are fed up with these kinds of clichéd story lines. Even those so called terrorists will feel bored of these kinds of stories. Then why there is a controversy? 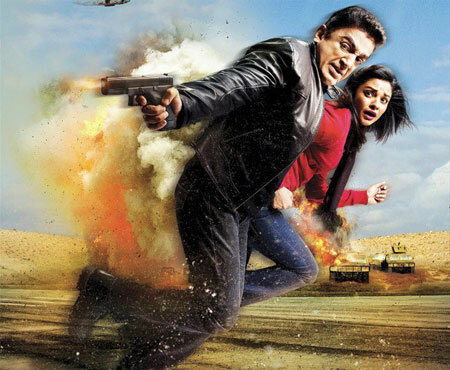 When it is the turn of a verdict Viswaroopam will be marked as a one-time watch. Just to experience the production quality. If possible, try to watch it in a theatre, where the well- praised Auro 3D Sound system is installed.